The CarMax Business Office supports the daily business of buying and selling cars through Associate engagement and compliance. This area serves as a partner to all functions of the store and ensures that all paperwork is developed and processed accurately and efficiently in order to deliver exceptional customer service. Under general direction from the Business Office Manager, this position is responsible for providing administrative support to the store management team and Associates. Duties include coordinating the candidate application and interview processes; supporting new Associate orientation; assisting with store events (i.e. communication meetings, regional team store visits, Associate and Manager meetings, etc. ); maintaining/ordering store supplies, posters and other communication documents; documenting travel expenses; and providing clerical/phone/data entry support of all business areas as needed. This entry-level position begins with comprehensive training, after which you will be able to expertly assume a wide variety of functions, focused on delivering exceptional service to both internal and external customers. Responsibilities include processing documents associated with customer vehicle purchases, assisting customers with questions on tag and title information, processing title transfers, completing DMV paperwork, assisting our purchasing team with in-store auctions, handling accounts payable functions, tendering cash transactions, and preparing bank deposits. We offer both full- and part-time positions and no previous automotive experience is required. The Lead Business Office Associate is responsible for supporting all Associates in the Business Office by providing technical support, giving peer-to-peer feedback, and leading the team in the completion of daily tasks while ensuring the Business Office provides a best-in-class customer experience. This position is filled internally by a Business Office Associate. Our Assistant Business Office Managers are responsible for assisting in the management and operation of one of our fast-paced business offices and directly supervising a team of 15-20 Associates. Business office functions include processing critical paperwork, DMV and title management, warranties, accounts payable, and cash office administration. Other managerial responsibilities include the recruiting, hiring, scheduling, training, and developing of all hourly Associates; handling performance issues; ensuring adherence to procedures; resolving customer service issues; preparing and presenting reports; and attending meetings with store management. This position is filled internally by a Business Manager Trainee or a successful Lead Business Office Associate. Business Office Managers begin in training, completing an extensive hands-on program that includes self-paced study and on-the-job training. The Business Office supports the daily business of buying and selling cars, ensuring that all paperwork is processed accurately and efficiently to deliver exceptional customer service. 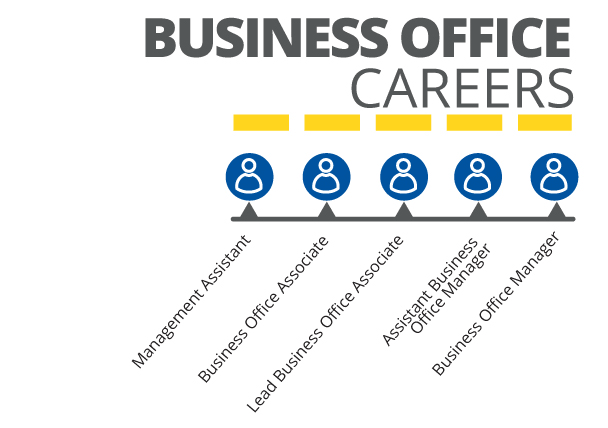 Business Office Managers must lead, motivate, and develop Associates working in the Business Office.